And using manhwa (만화), or Korean cartoons, is a good place to start. Sadly, my favorite “grown-up” comic-book poptoon (팝툰) sold its last edition back in March, but there’s lot’s more where that came from. 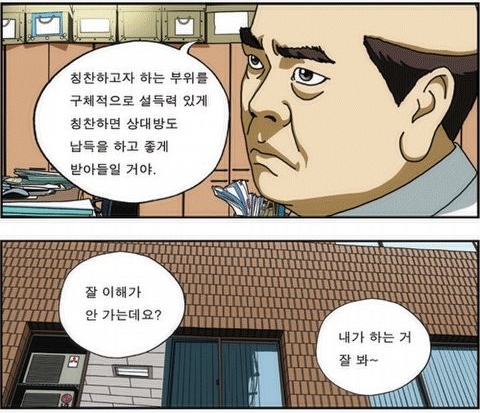 One possibility is Department Head Dal-ma (Dalmagwajang; 달마과장), available in the free Focus newspaper. Although it’s often very basic, requiring no Korean ability to get the gist of, you could do much worse than quickly translating it on your morning commute. Man: Miss Kim, what did you have for lunch? Miss Kim: I simply had ricecake at the park. 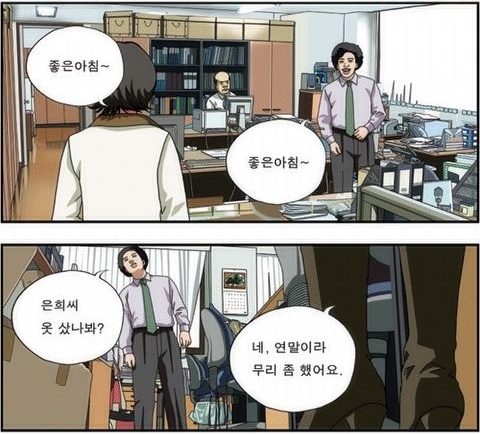 Even from just these first panels, already one thing of interest is that the man uses banmal (반말), or informal speech to speak to Miss Kim, and she replies in nopimmal (높임말), formal speech. No big deal there you might say: he’s probably her superior in the company. 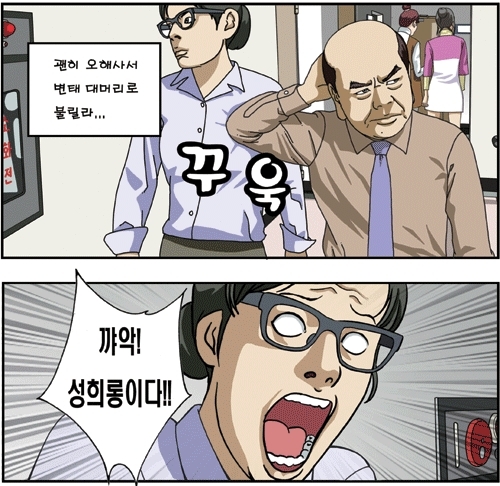 And as this recent incident on a subway demonstrated, using the appropriate level of speech to others is considered extremely important in Korea, with even many of my university students using nopimmal to friends just a few months older. 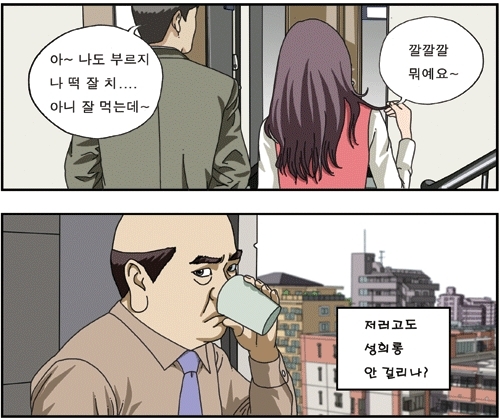 But then the same happens in the second cartoon too, even though the man addresses the woman with the semi-formal shi (씨) at the end of her name. 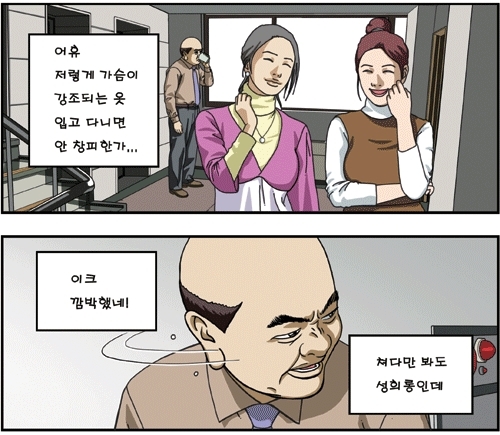 And while a brief survey of other Dalmagwajang cartoons does occasionally show men and women each using nopimmal to each other, I didn’t see any cases of a woman speaking to a man in banmal and he answering in nopimmal. Which is not to say that they don’t exist necessarily, but if there are any then I’d wager there’d be very few. If so, then is that just a reflection of reality? 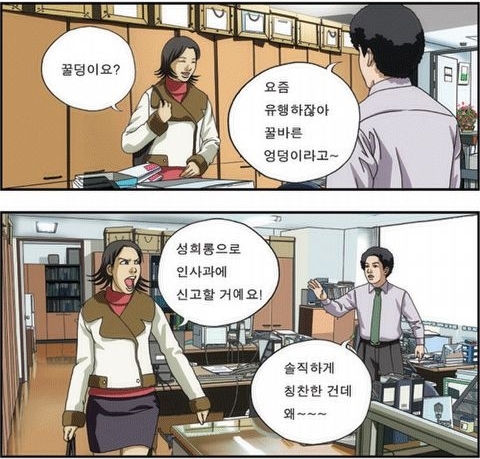 After all, women do tend to have junior and/or non-advancing positions in Korean workplaces, as even in 2011 it considered perfectly normal for them to resign and/or be fired upon marriage or becoming pregnant (only 50% of Korean women work, the lowest rate in the OECD). This tendency was most often seen in dialogue between husbands and wives or lovers. Besides dramas, foreign films showed the same tendency, with 12 of 15 films monitored by the group employing this dubbing practice. Clearly then, for TV at least there is a compulsion to conform to it. Whether that’s just the industry convention, fear of negative public reaction, and/or the personal choices of the translators themselves, then that remains to be seen, but I’d be surprised if that didn’t apply to some extent to other forms of media. Either way, you’re left with a pretty pervasive socialization agent, and one easy to overlook for English speakers, and/or even easier to get used to for native Korean speakers. Miss Kim: (Laughing) What do you mean? Dal-ma: Even acting like that, he won’t get accused of sexual harassment? This might sound strange, but personally I find that slang quite endearing. For not only does it seem quintessentially Korean (here’s another example), but with most Koreans living in the countryside until as recently as 1979, then it reminds me of the country’s strong agricultural roots too (no pun intended). Woman left: He really said that? Dal-ma: Wow! Look at her chest! Eek, I forgot! Staring is also sexual harassment. 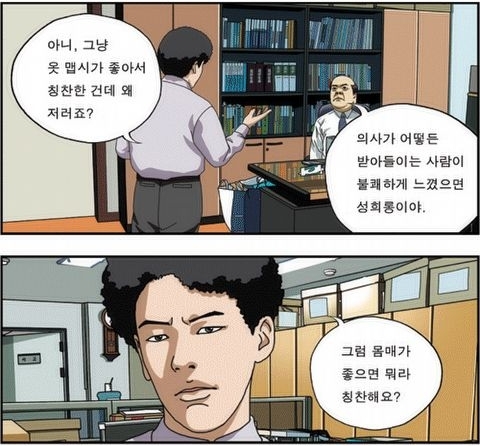 Dal-ma: (Worried) For no reason, because of a misunderstanding I’d be called a bald pervert. Woman: Eek! It’s sexual harassment! Having a shaved head myself, then I couldn’t help but chuckle at the unnecessary mention of his baldness here, as if that somehow makes his perversion all the worse. But with shaved heads being best known as a symbol of “prison, protest, or penance” in Korea, then unfortunately those negative connotations aren’t likely to go away any time soon. Women in background: Bald pervert! Dal-ma’s daughter: What’s wrong with Dad? 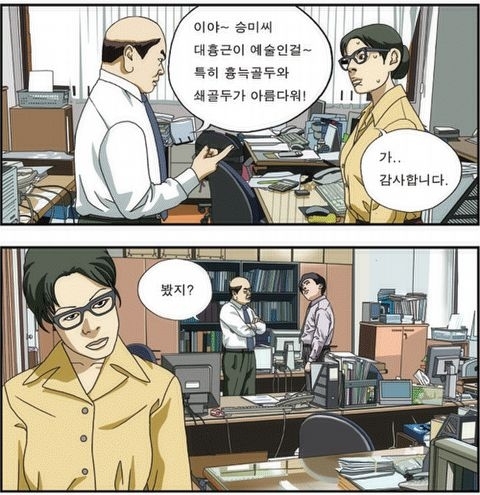 Dal-ma’s wife: He’s like that because working at the office is tiring. Man: Good morning! Eun-hee, you bought new clothes? Man: Wow, your back is a killer! Man: Yes, you’ve a perfect Honey-bottom! …apparently means, according to this article and allkpop, ‘sweet-as-honey thighs’ or “alluring as-if they-were-coated-with-honey thighs”, though a more creative, if incorrect, translation would be ‘alluring thighs that spread like honey.’ Ahem. 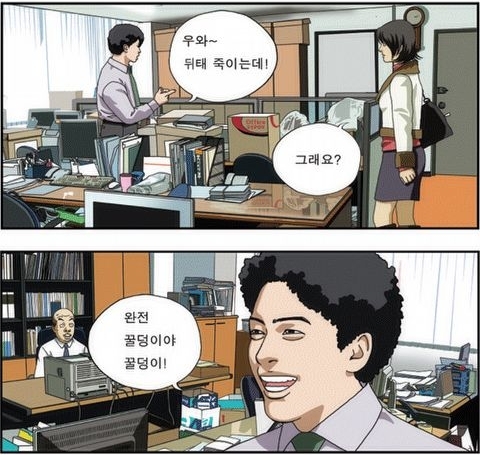 Eun-hee: I’m going to the Human Resources Department to complain about your sexual harassment! Man: Well, I was just complimenting her on how well her clothes fit. Why’s she acting like that? Dal-ma: It doesn’t matter what your intention is, it depends on how the other person receives it. If they feel uncomfortable, then it’s sexual harassment. Man: In that case, if someone has a good body, how can we give them a compliment? Dal-ma: If you intend to compliment a certain part of a person’s body, then do it precisely. Then, the other person will take it well. Man: I don’t really understand. Dal-ma: Watch me do it. Dal-ma: Sung-mi, your pectoral muscles are amazing. And your Sternocostal joints and Sternocleidomastoid muscle are beautiful! No, I didn’t find them funny either. 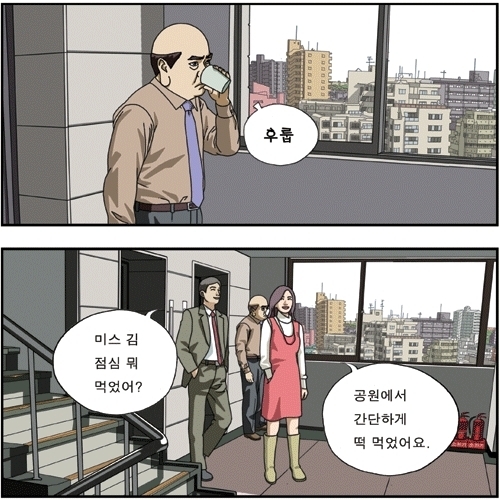 What’s more, they give the impression that all it takes to deal with sexual harassment in Korean workplaces is a quick visit to the Human Resources Department, and consequently that male employees are very nervous about being accused of it. Unfortunately though, as this case at Samsung and these recent testimonies by victims demonstrate, the reality is anything but. Why the discrepancy? That’s a good question, and it’s made me curious to see if its also found in other newspapers, and so on. Which is not bad for a couple of quick cartoons over my morning coffee, yes?